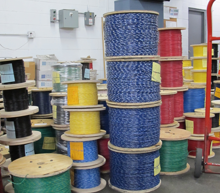 Atlas Wire can meet your needs for UL Appliance Wire (AVLV2). Atlas Wire has over 50 years of experience making wire that meets the exacting requirements of UL 758 Standard of Safety for Appliance Wiring Material. The Appliance Wire manufactured by Atlas Wire can be used in a number of appliances. Atlas Wire can insulate over 260 unique UL AWM Style numbers. UL Appliance Wires will pass various durability and heat aging tests to assure its ability to perform as a component in UL Listed or Classified products. Atlas Wire is proud to carry UL Appliance Wire so you have a product you can count on. They include Bonded Wire Ribbon Cable, Dual Extrusion Wires that are Double Insulated, Two Conductor Speaker Wire and various types of Single Conductor Hookup Wire with a wide range of Insulation and Wall Thicknesses. If you need a supplier you can count on for UL Appliance Wire with low minimum order quantities, and quick turn deliveries, you should contact us at Atlas Wire. Call us today at our Illinois Office at (847) 678-1210 or our Arizona Office at (520) 747-4500. If you prefer, Send Us a Message and let’s talk about how we can meet your needs for UL Appliance Wire. Click on a product subcategory below to view our appliance wire selection.